Whether it’s a compilation of the year’s top movies, the best restaurants in California, or the best rock and roll artists of all time, count me in. I delight in making my own such lists, critiquing others’, and debating the relative merits of each. With this week’s celebration of the National Park Service’s centennial anniversary, I’ve heard and read lately about lots of folks’ favorite national parks. It’s a subject about which people have passionate views, and regarding which reasonable minds can and do often differ widely. That’s because the particular parks, monuments and historical sites that together comprise our vast national park system resonate to a greater or lesser degree based on any number of an individual’s subjective, personal criteria. 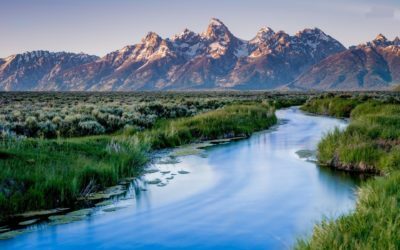 The Snake River flows beneath the looming peaks of the Teton Range in Grand Teton National Park. Most first-time visitors to northwestern Wyoming tend to flock immediately to Yellowstone. But I confess that the Grand Teton National Park is my favorite. The iconic view of the Snake River meandering beneath the snow-capped Tetons is, to me, the finest natural vista in the entire United States. (If you want to experience that vista at its very best, view it at dawn or dusk from the terrace of the Jackson Lake Lodge, and marvel at the way the Tetons’ colors change minute-by-minute.) I first visited Grand Teton National Park a quarter century ago, and have returned on numerous occasions to revel in its spectacular scenery, wildlife, Native American culture, 200+ miles of hiking trails and stellar Western art. Perfect. In 1903 President Theodore Roosevelt made a stop at the Grand Canyon as part of his legendary, eight-week tour of the American West. Like everyone else who sees the Grand Canyon for the first time, Roosevelt was awestruck. He urged the Arizona crowd that greeted him to preserve the canyon in its natural state. “Man cannot improve it,” he observed. Roosevelt took his own advice a few years later, when he invoked the Antiquities Act to make the Grand Canyon a national monument. Congress reclassified it as a national park in 1919. Every American owes it to him or herself to visit the Grand Canyon at least once. Viewed from the canyon rim or from the Colorado River that thunders through its depths, the Grand Canyon is a jaw-dropping environmental spectacle like no other on earth. The view from the floor of the Yosemite Valley, in Yosemite National Park. As is true of John Muir and millions of other Americans, I feel a special connection to Yosemite. It was the first national park I ever visited, as a young child of European immigrants who (like many visitors from overseas) themselves fell in love with the national park system in general and Yosemite in particular. I return to Yosemite almost annually, and the experience never gets old. Like most visitors, I spend most of my time there in Yosemite Valley, the majestic Mariposa Grove, Wawona and Glacier Point. Go to any of those popular Yosemite sites and you’ll experience a veritable United Nations of languages and peoples. It’s no wonder that famous Americans from Muir to Ansel Adams–along with lots of other visitors–have a special place in their hearts for Yosemite. Located on the northwestern-most coast of California is one of the (relatively) hidden treasures of the national park system: Redwood National and State Parks. Unlike most other national parks, Redwood is a unique partnership between the National Park Service and the State of California, who jointly managed a specular system of federal and state parks that hug 40 miles of California’s most rugged, pristine and isolated coastline. That system is best known for being the home of the tallest trees in the world, coastal redwoods. And the redwood groves are magnificent indeed, with some of the trees being over 2000 years old. Coupled with spectacular fern canyons, scenic hiking trails, abundant wildlife and a glorious meeting of land and sea, Redwoods represents another unique experience. And, unlike most of our best national parks, Redwood is seldom if ever crowded–even at the height of summer. Located on the island of Maui in Hawaii, the centerpiece of Haleakala National Park is the massive, extinct volcano that bears the same name. Like many of my other favorite national parks, Haleakala offers visitors a visual experience like no other. I first experienced Haleakala in the middle of the night, joining several other hardy park visitors who traveled to the top of the 10,000-foot Haleakala volcano before dawn to endure freezing temperatures (yes, in Hawaii!) in order to witness a sunrise the likes of which I’d never previously experienced. After sunrise, many Haleakala visitors proceed to ride bikes down the backside of the volcano to rejoin sea-level Maui civilization. However, I opted to take a solitary hike down to the bottom of Haleakala’s crater, traveling through a natural environment that was devoid of vegetation but nonetheless spectacular. The Park Service titles Glacier National Park the “Crown of the Continent.” That’s an accurate description, inasmuch as Glacier straddles the Continental Divide in northernmost Montana. Visitors often experience the park by traveling on what is perhaps the nation’s most spectacular and scenic road trip, on the Going-to-the-Sun Road that connects the east and west sides of the park. Another option is enjoying Glacier’s 734 miles of hiking trails, from which visitors can get a close look at some of North America’s most majestic flora and fauna. And, of course, there are the spectacular glaciers from which the park derives its name. They were still impressive when I first visited Glacier National Park in 1997, but climate change is quickly altering that; scientists project that the park will be misnamed by the end of this century. Go see the park and its glaciers while you still can. Sunrise over Monument Cove in Acadia National Park. Located on the Maine coast, Acadia was the first national park created in the Eastern United States. In my opinion, it’s also the best. Like the National Park Service itself, Acadia was created in 1916 and so is also celebrating its 100th birthday this year. The park is a stunning meeting of land and sea. Near Bar Harbor, the 74-square mile Acadia National Park occupies both part of the Maine coastline and several nearby islands. Despite its remote location, Acadia attracts well over two million tourists a year. Intrepid visitors who are willing to hike to the top of the park’s Cadillac Mountain in the pre-dawn will be the first people in America to see the sunrise. Enough said. 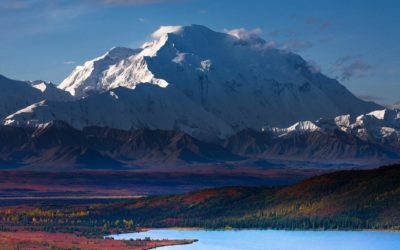 Denali, the highest peak in North America, and centerpiece of the eponymous National Park. Some of my favorite national “parks” are not parks at all but, rather, other stellar assets of the National Park Service. One example is the John Muir National Historic Site in Martinez, California. On its website, the National Park Service aptly refers to Muir as the “Father of the National Park Service.” Founder of the Sierra Club, Muir’s writings and lobbying convinced federal officials in the late 19th and early 20th centuries to protect as national parks Yosemite, Sequoia, the Grand Canyon, Mt. Rainier , Petrified Forest and other American special places. So it’s only fitting that the Park Service operates as a national historic site the beautiful Victorian home in Martinez, California where Muir lived and worked during the latter portion of his life. A pilgrimage to the John Muir National Historic Site–along with the nearby Muir Woods National Monument, a beautiful redwood grove similarly named in Muir’s honor–is a must for any fan of the park system, Muir, or both. To round out my top 10 list, I consider together (for reasons explained below) the Robert E. Lee Memorial and the National Mall. The Robert E. Lee Mansion, located on a stately hill in Arlington, Virginia overlooking Washington, D.C., was the famed 19th-century general’s home until he resigned his U.S Army commission at the beginning of the Civil War to lead the Confederate troops against the Union. During the war, a vengeful federal government appropriated Lee’s mansion and the lands surrounding it as a burial ground for Union troops killed in battle–what eventually became Arlington National Cemetery. A half-century later, a far less vindictive U.S. government designated the mansion as a national memorial to General Lee, a belated gesture of respect Lee earned from North and South alike for his work to reconstruct the nation in the years following the Civil War. A visit to the portico of the Lee Mansion, managed by the Park Service, provides what I believe to be the most stunning and moving vista in the urban United States. From there, one looks directly below at the Arlington Cemetery graves of John and Robert Kennedy, then across the Potomac River to, in sequence, the Lincoln Memorial, the Washington Monument and the U.S. Capitol–collectively, the key features of the National Mall in Washington, D.C. (The National Mall and its Memorial Parks are also managed by the Park Service, and draw 25 million visitors annually.) The view from the Lee Mansion is, especially at dawn or dusk, an achingly beautiful sight–full of the sorrow, promise and majesty of the American experience. An early morning view of the National Mall in Washington, D.C. from Arlington National Cemetery.